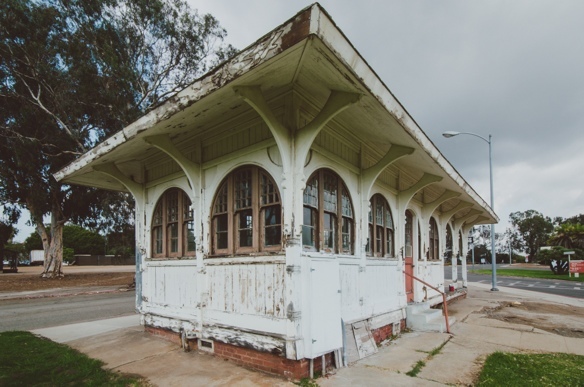 ART OF TRANSIT: The old streetcar depot on the VA campus in West Los Angeles. It was built in 1900 — and looks like it was last painted around that time — and is on the National Register of Historic Places. Here is a story that ran in the L.A. Times today about a new study alleging that the VA is putting hundreds of historic properties at risk of demolition by failing to maintain them. It’s not really related, but the Purple Line Extension’s station at the VA Hospital will be near the trolley stop, but on the south side of Wilshire Boulevard. Metro’s Board of Directors in October voted to begin exploring a countywide bike share program — in effect, ending the city of Los Angeles’ efforts to start a program through BikeNation, a private firm. The Downtown News reports that problem with the city’s effort, and one that could plague the countywide effort, is a contract the city of L.A. has with two outdoor advertising firms that gives them exclusive rights through 2021 to the kind of ads that would presumably be used to help fund a bike share program. Other cities aren’t encumbered with these kind of deals, allowing them to seek exclusive advertisers for their programs — for example, the CitiBikes in Gotham. A very well-written explanation of how earthquake faults are mapped in California and the efforts underway to better map the Hollywood Fault. The issue in Hollywood involves development: two skyscrapers are proposed for a site that critics say is on top of the fault. The bigger issue is that due to state budget cuts, many fault maps need updating, the reason Metro had to perform its own set of tests to determine the location of the Santa Monica Fault and the West Beverly Hills Lineament when planning the Purple Line Extension. The $2.2-billion project would build 21 miles of light rail through the busy D.C. suburbs in Maryland, providing connections to Washington Metro rail lines and commuter rail. The deal would involve getting $900 million in federal funds and then have a private firm or firms provide up to $900 million of the cost in exchange for receiving $100 million to $200 million annually for 30 to 35 years to operate and maintain the line. It will be interesting to see if they can make it work. These deals always sound plausible on paper but often prove difficult to engineer in the real world. A very interesting article about efforts to install protected bike lanes on Chicago’s South Side and the somewhat mixed reaction by African-American churches in the area who feared loss of parking. But the Utne Reader dives deeper and looks at the views by some that bike lanes — sometimes known as ‘white lanes’ — are the prelude to the kind of gentrification that could change their neighborhoods in profound ways, and not all of them for the better. A really fascinating and fair piece of journalism. Read it. 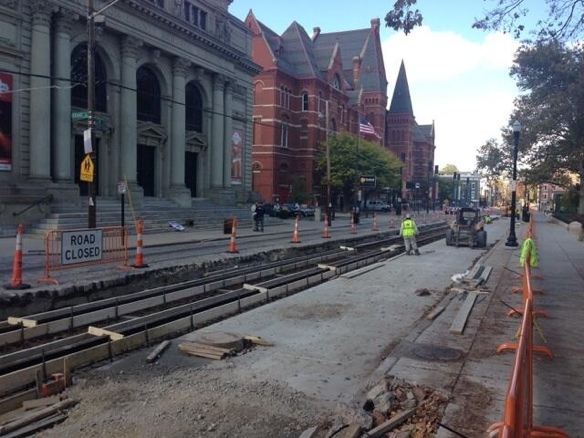 The mayor-elect of the Queen City doesn’t like Cincy’s effort to build a downtown streetcar. Construction has begun and a half-mile of track may be built by the time he takes office — and the cost of stopping it may be more than building it. One of the often heard complaints about the project (one of many similar projects around the country) is that the money would be better spent on improving bus service in town. I really don’t know what the fuss is about. Gee, Japan experienced one of the largest earthquakes known to the modern world two years ago and I didn’t see news reports of high rise skyscrapers falling down all over Tokyo. Modern science and engineering allow us to build earthquake proof high rises and mega-projects. These people act like there hasn’t been any progress in these fields since the 1950s, therefore we shouldn’t be doing it. Just an FYI, the earthquake in Japan wasn’t anywhere near Tokyo. I think his point is that Tokyo is a seismically active area, like LA. They have earthquakes there all the time, just like we do (check the USGS website for the weekly earthquake reports). Tehran is another example of an earthquake prone city with both tall buildings and underground rail. If Tehran and Tokyo can make it work, LA can make it work. Cincinnati started building a subway system in the 1920’s,ran out of money, and never completed the project.It never hosted a paid passenger. It still exists today, with no real use, except for a water main that runs through the tunnel. I hope the current streetcar system is not stopped, lets just hope history doesn’t repeat itself. Metro Rider has a valid point. Structures are designed and engineered to be earthquake proof, especially here in CA. The entire island of Japan, and the Tokyo area rests on top of where the North American plate, Pacific plate, Philippine plate, and the Eurasian plate confluences. If it’s earthquakes and faults to worry about when building mass transit projects and high density skyscrapers, Japan and Tokyo is the place to look at where they get the job done with a great safety record. And Japan PROVED that safety record with their magnitude 9.0 earthquake 2 years ago. Who in the world can boast “our buildings didn’t fall and our mass transit stayed safe under a magnitude 9.0 earthquake?” that isn’t based on theory, but in a real world natural disaster situation backed up with cold hard data? All these NIMBY concerns about earthquake matters is nothing but BS. It’s clear as night and day that they are doing this to get projects killed.